Quick post to show you a couple of demos at the Portrait Society convention here in Atlanta earlier today. 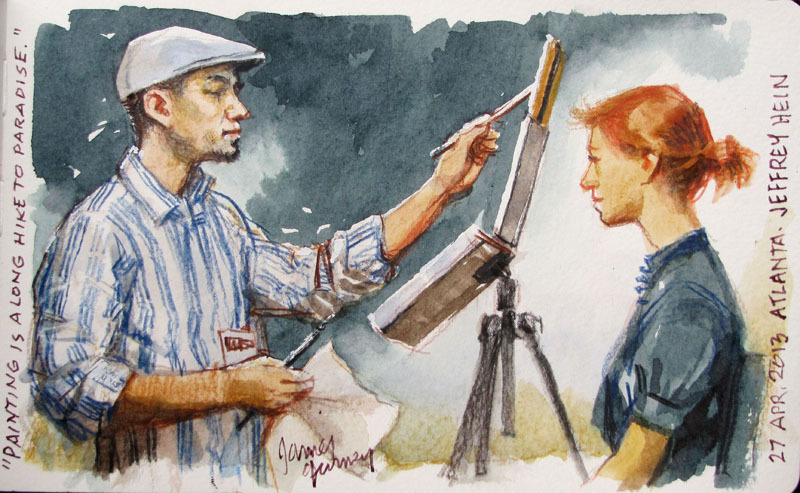 Here is a watercolor sketch I did of Face-Off champion Jeffrey Hein painting Kate Stone on the main stage. Jeffrey said, "Painting is a long hike to paradise," meaning that it often takes a lot of steady, difficult, and unpleasant toil to arrive at a joyful result. Four steps in the process of my sketch, which was about 5x8 inches. 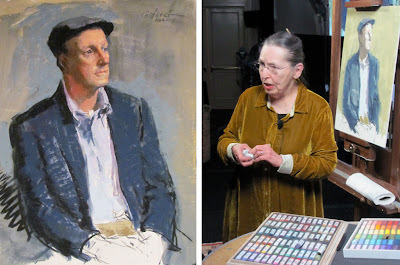 Later I had the honor of sitting as the model for Judith Carducci as she did a two-and-a-half hour portrait in pastels. She charmed the audience with limericks and solid painting advice as she worked. It was fun to be on the other side of the easel. Thanks, Judy! Underpaintings blog has good photos of all the Face-Off paintings. James, I think you have me officially addicted to your blog. I must have spent the better part of my day looking at posts, videos and painting gear. Thank you for sharing so much art! Just to make an official note of it - I am jealous of my fellow 'Howers' Dragonlady and Jerome who met you in 2008. Good grief has it already been five years? How time flies! Yes it was very nice to chat, and just as amazing to see all these original paintings after seeing them on a computer screen all the time. You must have indeed browsed the entire blog to "bump" into that old post! Very inspiring as usual, I would love to try pastels but they're a bit messy to work with in your flat. Very happy to report that I cleaned out all my watercolor palettes today and took my brushes out for a sorely needed spin. All these artists saying it's a difficult road, and not one of their progress stills ever looks anything other then masterful.